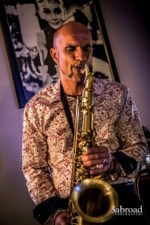 Two sax players; Paul Andrews (Fremantle) and Irene de Vocht (Netherlands) met each other a few months ago and were both yearning for a regular, high quality music night in central Fremantle. Paul Andrews recalls “We wanted to create an atmosphere where people feel at home and a place for the Freo community to sit down, have a drink and a chat and meanwhile enjoy high quality music”. The result; Automatic Sound Series every Monday night at the Flytrap. A night to meet fellow musicians, enjoy their music and share the stage with them. Also an opportunity for the Fremantle community to discover new music and meet people in a relaxed ambiance. The night not only provides a platform for established artists/groups, but also for new, young, talented musicians. It has been going for a month and so-far everyone who experiences this little room, loves it. The musical content is very broad; from electronica, contemporary jazz to minimal, to soundscape, to world music. The Automatic Sound Series has so far been host to some amazing performances from Masonik, the Alex Borthwick Trio, Gemma Farrell’s Quartet, and young trumpeter Matthew McGlynn. Also, many beautiful moments have arisen during the open stage jam sessions. AUTOMATIC SOUND SERIES on Monday nights 7.30 at the Fly Trap (Victoria Hall) on 179 High Street. Tickets are $10 at the door, all the money goes to the musicians who perform on the night.